Project instructions go well beyond simple line drawings to show the assembly process of each piece in a series of step-by-step photographs. 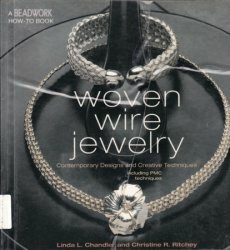 The nine projects begin with an elegantly simple woven bracelet and move on to more dramatic projects that include a domed cuff bracelet with soldered bead ends, a free-form bracelet, a woven neck piece, and a pendant with a woven frame. Projects range in difficulty from easy to advanced, and many can be completed without soldering. The more experienced craftsperson will savor the way Precious Metal Clay adds striking embellishments to three of the projects.